Aizawl, Jan 22 : More than 20,000 people across Mizoram, which had banned liquor in 1996, have collected application forms to get a card which will allow them to purchase alcohol. With the new liquor law coming into effect from January 2015, wine shops will make an entry in Mizoram from March 2. The new liquor law -Mizoram Liquor Prohibition and Control Act, 2014 - was passed by the state assembly in July last year. The new law replaced the Mizoram Liquor Total Prohibition Act, 1995. Though the newly-enacted law is still a 'Prohibition act', consumption of liquor is no longer an offence. Anyone, who is above the age of 21 and wishes to drink, will have to apply for a card which will enable him or her to purchase a maximum of 6 bottles of liquor every month. 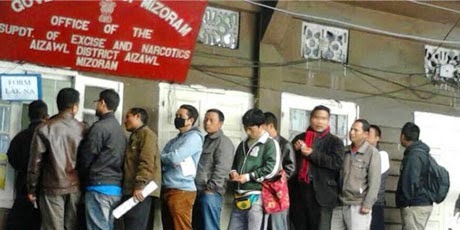 Long queues were seen outside the Aizawl excise and narcotics department office, near Congress Bhavan. Each application form costs Rs 20. Three PSUs, the Mizoram Food and Allied Industries Corporation (MIFCO), the Mizoram Agriculture Marketing Corporation (MAMCO) and the Zoram Industrial Development Corporation (ZIDCO), have already submitted applications to the state government to man the wine shops. The shops are expected to help the PSUs tide over financial problems, state excise and narcotics minister R Lalzirliana said. Meanwhile, a number of people have been arrested since January 15 for violating the MLPC Act, 2014. Most of them have been convicted and sentenced to do public service by cleaning places like the compounds of the Aizawl Civil Hospital, Aizawl district court and the state excise and narcotics department office. Others have been sentenced to undergo month-long prison terms or pay a fine of Rs 1,000.